Recent advances in the management of GCT developing in Paget’s disease of bone. 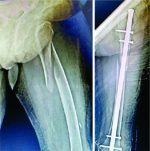 Dr. Ashish Gulia, Department of Orthopaedic Oncology, OPD – 93, Main Building, Tata Memorial Centre, Parel, Mumbai – 400 012, Maharashtra, India. Introduction: Paget’s disease of bone (PDB) is a disease of elderly characterised by disorganised bone remodelling. Development of secondary neoplasm in PDB is a known but rare phenomenon. Development of Giant cell tumour in PDB (GCT-PDB) is extremely rare and little is known about its etiopathogenesis and management. We present a case report of such a development with review of literature and the role of various new modalities of treatment available in the management of this rare condition. Case report: A 40 yr old gentleman presented with back pain and on evaluation was diagnosed as a case of polyostotic pagets disease of bone. He was treated with iv bisphosphonates, calcium and vitamin D supplements. After an asymptomatic period of 3 years he presented with a gluteal mass involving ilium and sacrum which was confirmed as GCT on biopsy. Serial angioembolization was attempted but mass progressed so surgery performed with excision and curettage of the lesion. He presented with a local recurrence 2 years later with a large soft tissue component. He was started on denosumab, RANKL inhibitor, with the aim to downstage the lesion. Patient showed good response after 6 doses with reduction in soft tissue mass followed by which he underwent surgery with partial T-1 internal hemipelvectomy and curettage of sacrum. Currently patient is asymptomatic at a follow up of 15 month. Conclusion: GCT- PDB is a rare phenomenon occuring mainly in polyostotic pagets disease of bone and is associated with more severe manifestations of the disease. The management is challenging and requires multimodality management. Pharmacological agents include use of bisphosphonates and RANK ligand inhibitor – denosumab. Though surgery is the mainstay of treatment for GCT, other modalities of treatment like RANK Ligand inhibitors (denosumab), selective arterial embolisation or radiation therapy has to be used for inoperable cases or where surgery would be functionally too morbid especially in cases of GCT -PDB where the disease affects more commonly the axial skeleton. Keywords: GCT, Pagets disease, Denosumab. Paget’s disease is a disease of elderly seen commonly after the fifth decade of life characterized by remodelling of bone in a disorganized manner. Development of primary bone neoplasm is a rare but is known complication of PDB. Long term evolution of Paget’s disease increases the risk of various malignant tumors like osteosarcoma, fibrosarcoma, chondrosarcoma, malignant fibrous histiocytoma and very rarely locally aggressive tumor like Giant Cell Tumour (GCT) The reported cases of GCT complicating Paget’s occur mainly in polyostotic disease . In view of its rarity, there is only modest information available about the aetiology and management of GCT-PDB. In addition, newer developments in the management of both these disorders has enabled new avenues for combined multimodal management in this rare co-existence. We present a case of GCT developing in the background of polyostotic Paget’s disease of bone. We also discuss the mechanism of development and multimodality treatment available for the management in such an uncommon situation. A 40-year-oldgentleman presented with low backache of 5 years duration. He was evaluated clinically and radiologically. A diagnosis of PDB was made. Bone scan revealed multiple site involvement (skull, sternum, dorsal & lumbar, pelvis, ribs,femur and tibia) (Fig. 1, 2, 3, 4). Bone biopsy from the iliac region revealed numerous multinucleated giant cells with haphazard new bone formation and diagnosis of polyostotic Paget’s disease was confirmed. The patient was treated with intravenous bisphosphonate every 3 weeks (pamidronate 60mg IV infusion) with vitamin D and calcium supplement at another institution. He was apparently alright for 3 years, when he noticed a lump in the right gluteal region. It was associated with dull aching localised pain. Radiographs revealed a lytic lesion in right posterior Ilium and an MRI of the pelvis showed a large lesion with an extra-osseous soft tissue component involving the iliac bone and adjacent sacral ala . Blood investigations showed an elevated serum alkaline phosphatase. CT guided trucut biopsy from gluteal mass was diagnosed as giant cell tumour. Serial angio-embolizations (Fig. 6 ) were attempted with an intent to control the disease without surgery owing to the complex anatomy and associated morbidity of surgery,but the mass progressed in size. A decision for surgical excision was taken. Excision of soft tissue mass with curettage and cementation of the right sacroiliac component of the lesion was done. The final histopathology report confirmed GCT in case of Pagetoid disease of bone. Two years after the surgery, he presented with a large local recurrence involving the posterior ilium and sacral ala. The recurrence was confirmed with a repeat biopsy. He was started on Denosumab, a monoclonal RANK Ligand inhibitor in an attempt to down stage the lesion and thus reduce the morbidity of surgery. Denosumab was administered at a dose of 120 mg subcutaneously at monthly intervals with loading doses at day1, 8 and 15. 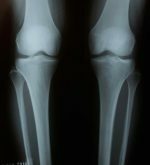 A repeat MRI evaluation, after 6 injections of denosumab, revealed a good response with shrinkage of the soft tissue mass. He then underwent partial Type-1 internal hemipelvectomy and curettage of the sacral lesion ( Fig. 5, 7, 8,9,10). At a 15 month follow upthe patient is asymptomatic and disease free. Inspite of a reported increased incidence of GCT of bone in the Asian population, most of the cases of GCT – PBD have been reported in Caucasians. This may be explained by the fact that the incidence of PDB is higher in western population as compared to Asians. Available data also suggested a significant prevalence of familial GCT occurring in PDB in Italy region. A systematic review  was conducted to identify cases of CGT occurring in PDB patients (PROSPERO database registration number: CRD42014007030). The analysis revealed some unique characteristic of GCT developing in Paget’s disease. The majority of ethnicity in this study were Caucasians of European ancestry 82% and around 8 % were Asian. GCT in PDB more commonly involves the craniofacial bones followed by pelvis and spine as compared to GCT which commonly occurs at an epiphyseal location. The understanding of genetics and pathophysiology of GCT has considerably increased since the discovery of RANK/ RANK-L (Receptor Activator of Nuclear factor-kappa B ligand) pathway which is an important osteoclastic differentiating factor. Osteoblasts and stromal stem cells express RANKL, which binds to its receptor RANK, on the surface of osteoclasts and their precursors. This regulates the differentiation of precursors into multinucleated osteoclasts. Studies have shown that RANKL is over expressed by stromal cells in GCT tissue. These stromal cells are the neoplastic mononuclear cells in GCT and it is postulated that the molecular signals from these stromal cells promote the formation of multinucleated osteoclast like cells. The multinucleated giant cells causes the osteolysis .The pathogenesis of PDB involves mutations / polymorphisms identified in genes TNFRSF11A encoding RANK, TNFRSF11B encoding osteoprotegerin, VCP(Valosin containing protein ) encoding p97, and SQSTM1 encoding p62 play a role in the RANK-NFKB signalling pathway[4,5]. Thus RANK/RANKL pathway seems to be an interlinking pathway in the development of GCT in Pagets disease. However, how GCT may develop in PDB is not yet clearly established. .
GCT-PDB cases should be treated on the same principles as that of GCT. A thorough clinical and hematological evaluation is must in order to understand both the pathologies. Surgery is the standard of treatment in GCT, which may be either function preserving curettage or more morbid procedure like resection. Traditionally bisphosphonates have been used in the management of surgically non-resectable GCT either alone or in combination with angio-embolization. This leads to induction of osteoclasts apoptosis leading to decreased bone restoration and bone healing. Similarly Bisphosphonates have also been used as a drug of choice for the management of and are also the treatment of choice in Paget’s disease of bone. Introduction of newer agents like Denosumab [9,10],a human monoclonal antibody, has shown early promising results in managing the GCT at difficult sites. Denosumab inhibits the development of osteoclasts and their activity thereby reducing bone resorption and increase in bone density and shrinks the tumor mass.Though its use has been popularised in reducing the skeletal related events in some carcinomas like breast and prostrate carcinoma it is proving to be effective in controlling the growth of axial GCT where resection may be really morbid  Literature search has shown cases where denosumab is used as a therapeutic agent targeting the pathophysiology in PDB . Though currently not included as a standard of care in PDB but expected to become one of the potential therapeutic agents in the future.The duration of denosumab therapy is still a matter of debate but complete cessation of therapy has seen resurgence of disease in most of the cases. Histopathological studies have shown complete apoptosis of multi nucleate giant cells but stromal cells do show resistance to its treatment and are considered responsible for the recurrence of the disease. This modality may be combined with arterial embolization  to have effective disease control at axial sites. For refractive cases Radiotherapy  can be tried in carefully selected cases. GCT developing in the background of Pagets disease is a rare occurrence which is commonly seen in polyostotic PDB. GCT-PDB is associated with more severe manifestations of the disease with reduced life expectancy. Various modalities of treatment can be used depending upon the individual case. Pharmacological agents include use of bisphosphonates and RANK ligand inhibitors. 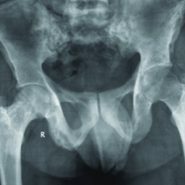 Though surgery is the mainstay of treatment for GCT, denosumab, selective arterial embolisation or radiation therapy has to be used for inoperable cases or where surgery would be functionally too morbid especially in cases of GCT -PDB where the disease affects more commonly the axial skeleton. Management of GCT- PDB is challenging and requires multimodality management. Surgery is the mainstay of treatment but one should be aware of all the armamentarium available like bisphosphonates, RANK ligand inhibitor, angioembolisation and radiation therapy to downstage the lesion facilitating surgery or as a definitive modality of treatment in inoperable cases. The recent advances has led to successful cure and lesser morbidity in the treatment of this rare condition. 1. Roodman GD. Studies in Paget’s disease and their relevance to oncology. Semin Oncol. 2001; 28 Suppl 11:15-21. 2. Hoch B, Hermann G, Klein MJ, et al. Giant cell tumor complicating Paget disease of long bone. Skeletal Radiol 2007; 36:973-978. 3. Rendina D et al. Clinical Characteristics and Evolution of Giant Cell Tumor Occurring in Paget’s Disease of Bone. J Bone Miner research 2014 Sep 4. 5. Boyce BF1, Xing L. The RANKL/RANK/OPG pathway; Curr Osteoporos Rep. 2007 Sep;5(3):98-104. 9. Branstetter DG, Nelson SD, Manivel JC, et al. Denosumab induces tumor reduction and bone formation in patients withgiant-cell tumor of bone. Clin. Cancer Res. 012;18(16):4415– 24. 10. Piotr Rutkowski, MD, PhD1, Stefano Ferrari, MD2, Robert J. Grimer, MB, BS3 et al, Surgical Downstaging in an Open-Label Phase II Trial of Denosumab in Patients with Giant Cell Tumor of Bone. 11. Mattei TA1, Ramos E2, Rehman AA3, Shaw A2, Patel SR4, Mendel E5. Sustained long-term complete regression of a giant cell tumor of the spine after treatment with denosumab.Spine J. 2014 Jul 1;14(7):e15-21. 12. Hirao M1, Hashimoto J.Denosumab as the potent therapeutic agent against Paget’s disease of bone. Clin Calcium. 2011 Aug;21(8):1231-8.